What are the Best Spiral Binding Machines? If you have read my past "best" posts, than you already know that we have a stringent review process to evaluate these machines before we actually label them as the best. This process includes hands-on experience with the machine (something a lot of sellers don't have) and a corresponding evaluation of the features, functionality, durability, ease-of-use, etc. We also look at the manufacturer-supplied warranty length and coverage, as well as the popularity of the product from our customers, and their feedback. So with this evaluation in mind, paired with our over 75 years in the industry (plus my 10+ years alone) should instill confidence that these machines are truly the best of the time. So let's talk about the best spiral binding machines. 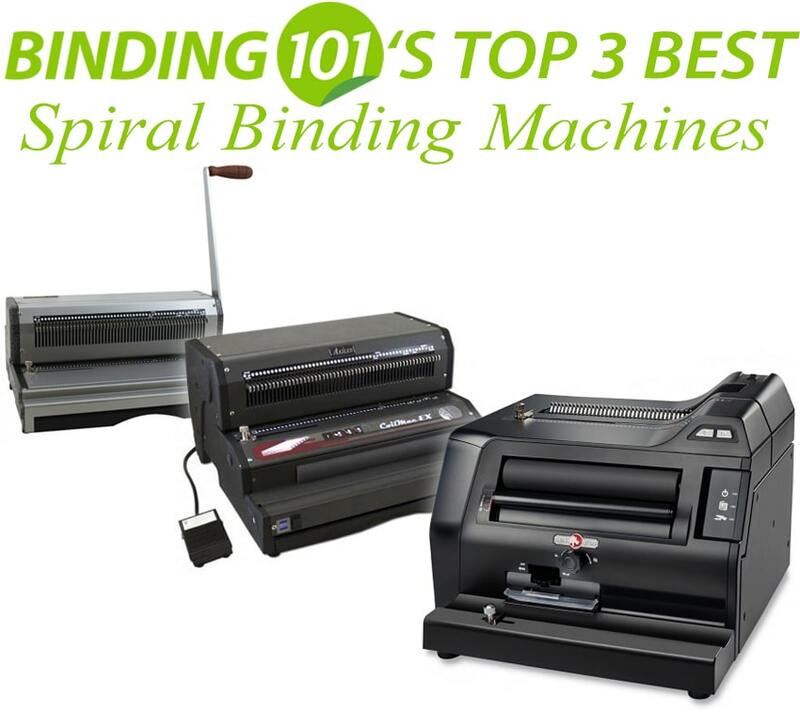 These may not be the ideal machines for all businesses, as you may have a strict budget, or simply different volumes of work that don't warrant these machines, but as a whole, when comparing all spiral binding machines available, these are our top 3 plastic coil binding machines for each volume of user. The first fits into the low-volume binding category, the second fits into the mid-high volume, and our top pick fits into the high-volume coil binder group. The Akiles CoilMac-M Plus is a manual spiral binding machine that is strong, and leagues above any other machine in the same low-volume class. Other manual binding machines, some even that are more expensive, are made of plastic materials that are a bit flimsy and wear out sooner. But the metal components in the CoilMac-M Plus mean it will stand the test of time, and offer consistent and quality punching and binding for coil, without special maintenance or repairs being needed. All of Akiles' binding machines have an included 1 year manufacturer's warranty. This is better than most low-volume brands, which typically only have a 30-90 day warranty on their machines. The 1 year is a mid-range for the larger machines in the industry, but for a lower-volume machine like this, it makes them stand out. When I was using this machine and evaluating it, I found the features easy to set up and use. It is pretty self-explanatory for anyone who understands the basic concept of punch-and-bind. There are no complicated settings or training needed, and binding with the CoilMac-M Plus can even be a fun activity for students. What sets the "Plus" model apart from the standard unit is the punching device. The pins are completely disengageable, which essentially means that you can control which holes are punched, and which are not. This feature is a lifesaver for those binding multiple sheet sizes. It also has a perfected 4:1 hole spacing; 4:1 is the standard in the industry for plastic coils, and this punching pattern is still a 4:1 (meaning there are 4 holes per inch), but the spacing is very slightly different. The perfected hole spacing makes a significant difference for the ease of inserting coils, and also make the top and bottom margins uniform, without needed adjustments. In addition, the holes that are punched are slightly oval (instead of round) which, again, makes inserting the spiral coils MUCH easier and faster, especially when using large coils on thick documents. The CoilMac-M models are some of our top-sellers for schools, smaller businesses, and sometimes even individuals who run a business from home. Some of the reviews from our customers on these machines include, "very sturdy product works as described! I would recommend! ", "we love this machine. It punched and binds all of our student's work cleanly and easily", "We use this for office proposals and presentations...it's a good quality machine for the price", and "...for the basics, it's solid and much less expensive than Kinkos". Remember, this rating is based on the PLUS model of the CoilMac-M; the standard model has the same durability, capacities, warranty, etc., but it does not have the completely disengageable pins or the perfected hole punch spacing. And for only about $50 more, the Plus offers significantly more versatility and value, and is absolutely worth the extra investment. The CoilMac-EX is another machine from Akiles. Can you tell we trust them?! They create high quality metal machines at incredibly affordable prices, so you can get more bang for your buck. The same holds true for these mid-level coil binding machines. The EX offers the power and strength that we have come to expect from Akiles, with the ease of use and modern sleek look. Their manufacturing has, once again, outshined the competitive machines in the same price class. As mentioned above, the standard 1 year Akiles warranty applies across all of their machines, including the EX punch and bind. This, like most warranties for binder machines, is against defects, and won't cover user error or abuse of the machine or naturally wearable parts. The EX is an electric punch AND electric bind for under $1,000. Electric punch-and-bind machines typically start at $1400 and go up to about $2K, so this is the least expensive way to combine the convenience and ease of an electric machine, without the high price point. In fact, it was manufactured specifically for the purpose of bringing the benefits of electric binding machines to users that may not have been able to afford them in the past. So why isn't this one considered high volume? Being electric doesn't always make a machine for high daily use. The motor and inner components are not made with all of the same materials, so it is not built to handle those heavy binding situations. In addition, it features a full-size single-roller inserter. This can help speed up the manual process of rolling the coil in by hand, but is not as efficient as a double-roller system. It fills the needs of a new niche of customers, where previously there was no solution. The CoilMac-EX is very simple to operate. The settings are clearly labeled and easy to adjust, and the fully disengageable punch pins are, of course, a feature that I always rave about. And our top pick for the best high volume spiral binding machine is the System 3000 from Rhin-O-Tuff. This machine actually gets me excited to talk about...it is so amazing in every way! Better than more expensive machines, offering more value. First off, it is very simple to operate. The punching throat is vertical (most are horizontal) which is a hidden benefit because it uses gravity to help jog your pages, which leads to a perfected punching pattern. The throat is open on one side, so you can do longer sheets easily. And it has those same fully disengageable puns for custom sheet patterns as well. With the System 3000 you have the option of pressing a push button or using a foot pedal to activate the punch, so it is dealer's choice. The coil inserter is dual-roller, and the space between rollers is adjustable to fit your coil, ensuring no snags or slow-downs. Just turn on the roller by pressing the button, and hold your book to the rollers --with coil inserted through the first few holes-- and watch to watch them speed that coil through your pages. But the speed is controlled and smooth, so it won't over-insert either. But our FAVORITE thing about the System 3000? The attached electric crimper! No more fussing with the cutter crimping pliers and making sure that red dot is up; just hold your book coils up to the crimper to finish your coils. This makes the CBS3000 the only electric punch, bind, and crimp machine that won't require a bank loan...in fact, it is under $1,500. The crimper can be fine-tuned to your coil size, and has an edge guide so you can set it for your pages, and then forget it. Plus all of these features are compacted into a small 18" x 18" footprint, so it won't take up a ton of space at your shop. Another great thing about the CBS3000 is that is is manufactured in the USA. With that comes the top quality products and parts that make up this all-in-one spiral binding machine. It also comes with a 1 year manufacturer's warranty. If you have the volume to warrant it, the Coil Binding System 3000 is a fantastic buy. It is sleek, innovative, easy, small, and one-of-a-kind. About the Author • Mallory Morsa has worked in several different departments in her 10+ years at Binding101. Beginning in customer service and sales, she honed in her skills to provide the customer with professional, fast, and accurate information. Shortly after, she was promoted to sales supervisor and also took on the role of product expert, training the team on new products and offering support wherever needed. Throughout this time, she also wrote content for the site, as well as contributed stock photography and videography. As the team grew, she was able to move to a new official position as the content specialist and social media manager. Her skills in these variety of areas give her the unique expertise to not just create content for the web, but to create content for YOU, the customer. In her free time, Mallory's favorite things to do include volunteering at the animal shelter bottle feeding neonatal kittens, reading at the park, and binge streaming TV shows with her 3 furbabies and family beside her.